I haven’t read many military books but the cover and description of this book got my attention. 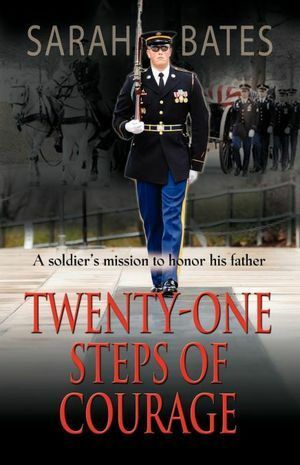 I enjoy military movies so I decided to give Twenty-One Steps Of Courage. I am so glad I did! Poor Rod, his father died in the Gulf War when he was just a young boy. Rod really looked up to his father and knew that he would follow in his footsteps one day. Rods older brother was in the army, fighting in Afghanistan. On Rod’s 18th birthday, he went to an army recruitment office to sign up. He didn’t even tell his mom, Donna, that he was going to do it. Because she already had a son in harm’s way, she was very upset. Rod also had a girlfriend at the time but she knew his plan and tried to be supportive. Rod had a checklist of all the army training and accomplishments he wanted to do. They were all the things his father did with the exception of one. His father died before he could accomplish his biggest goal of his army career, that of becoming a Sentinel Guard at the Tomb of the Unknown. Rod incurred a lot of roadblocks in his training. There were even times he thought about quitting. I would love to tell you more, but I don’t want to spoil it for you. Twenty-One Steps of Courage is jam-packed with adventure, a great plot, and even a little bit of romance. I think it is a book that would appeal to most readers with the exception of those who only read zombie books, LOL! I highly recommend it and give it 5 stars! Be sure to check out Sarah Bates's guest post: Gratitude. I'm so glad Sal enjoyed 'Twenty-One Steps Of Courage'. I really enjoyed it as well!